I don’t know about you, but every Advent, I struggle with the same thing: finding a balance. 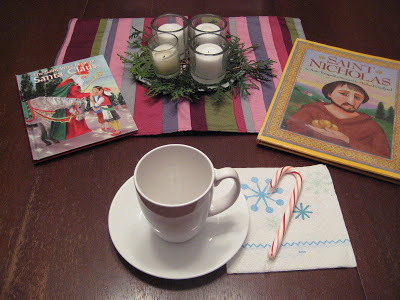 A balance between quietly and prayerfully celebrating the season. I see so many lovely ideas that I would like to do with my children, but if they cause me stress, are they really good to do? Is that really how the Lord wants me to prepare my family for His birth? Take, for instance, the Jesse Tree. I love this idea! A friend even gave me one of those felt kits to produce. I’ve always thought that if I cut it out over the summer, it would be ready to go come Advent. Good in theory. Not very realistic in life (at least not my life). As this Advent approaches, I am especially struggling with finding a balance. I simply don’t feel like I am going to be ready to enter into Advent. My mind is scattered, and my body just can’t keep up with it all! I desire peace and stillness, but how do I find them in this busy time? I am trying not to be anxious. Because I know the Lord doesn’t want that of me. And so, I am ever-so determined to keep Advent simple. And focused. Without many expectations or “crazy” ideas. Because I simply can’t. And even if I could, is that the approach to have anyway? Of course, we will have an Advent wreath. And every year, we read the delightful story, Destination Bethlehem. I wrote a bit more about it here. I also purchased this book to introduce my children to the Jesse Tree. Very simply, we will celebrate three feasts of Advent—St. Nicholas Day, the Immaculate Conception and St. Lucia Day. Last year, I made a little Advent playlist via iTunes. I really enjoyed listening to seasonally-specific music. The O! Antiphons will be hit-or-miss this year, perhaps completely optional, as I expect to be in the hospital during some of them. I would at least like to pray them during family prayer, though. And lastly, I’ve used this little chain idea in the past, and I think it is a simple, yet thoughtful, Christmas countdown. Now, for the shopping (almost done) … wrapping (ugh!) … baking (not likely) … and decorating (minimal). 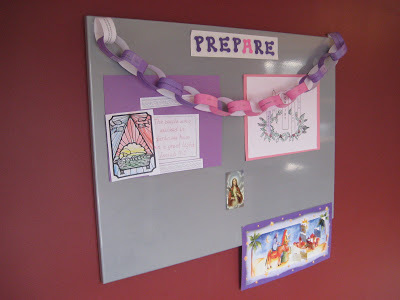 Not necessarily Advent activities but part of preparing for Christmas. But above all, how am I personally going to prepare my own heart to be ready to adore Him at His crib this Christmas? For isn’t that truly the most important aspect of this wonderful season? I've been reading how everyone is getting so stressed already during Advent. I have no idea what they are talking about. Probably because we have always taken Christmas "easy" because it's usually just our little family. I read somewhere to pick 1 thing. If I had an advent wreath, I would do that, but I don't have one & have not found one I liked. We were given a Jesse tree yesterday so for the first time we will do that. As far as presents go…my husbands family draws names, which makes it very easy. I will try to make a few homemade things for the babies in my life. We are probably not cooking a big meal for Christmas b/c as you know, baby Jacob will be due. We always go to Mass and really that is what I look forward to the most. It doesn't feel like Christmas until we've been to Mass. Sometimes we try to find a Cathedral or larger parish that will make it magestic with music and such. Anyways…it's all part of trying to live simply every day and find balance every day. I'm not going to let the craziness of the cluture this time of year affect me. As much as I can. Take care! Sorry for the looooong comment. PS: Love the new banner. Elisa, If you want to do an Advent wreath, you can make one simply enough. 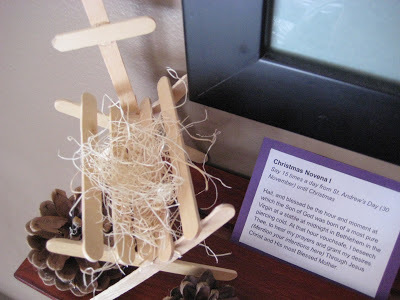 Check my archives for what happened to my Advent wreath last year, and how I made a simple one instead. It worked beautifully. Actually, you can see it in the St. Nicholas picture on this post. It was just white votives and some evergreen clippings on a tiny tray! You are right. I usually take the whole month of December off and celebrate the time of year. That is not possible this year as we are so behind with school!!! But simple is often better. I am so glad that you like my Advent Chain and posted about it on your blog! When I made it I hoped others would enjoying it as much as I do. Please do not link directly to any activity or game from my blog using its URL (the unique address for a file that is accessible on the Internet). You are always welcome to link to my blog and/or a specific post. take care of yourself…your babymoon will be here before you know it!